CD122 phenotype and function on rhesus macaque CD8 T cells. (A) Rhesus PBMCs were analyzed by FACS. Gates based on lymphocytes were defined by forward and side-scatter, (B) further gated on CD3+ T cells and then (C) CD8+ T cells and CD4+ T cells. (D) Gating on CD8+ T cells, an isotype control was utilized to define (E) CD122– versus CD122+ CD8+ T cells. (F) CD122– cells demonstrated higher frequencies of CD28+CD95– naive CD8+ T cells in contrast to (G) CD122+ cells which were predominantly TEM CD28–CD95+ or TCM CD28+CD95+ CD8+ T cells. 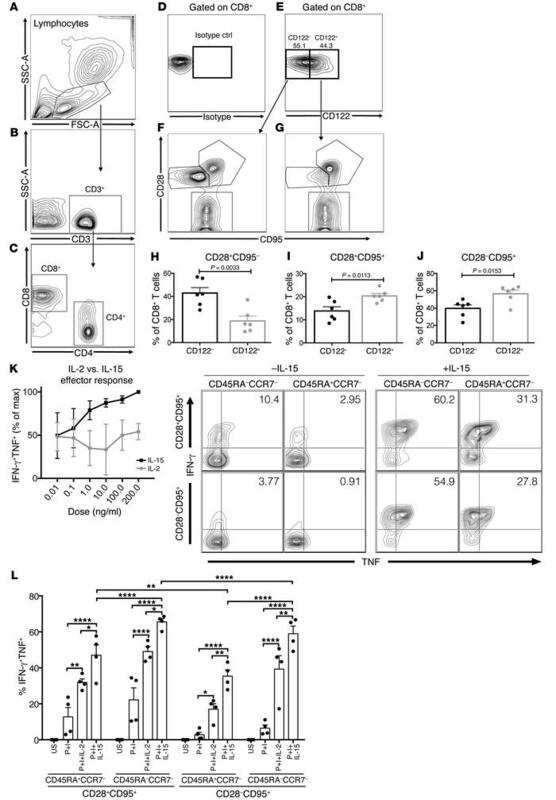 (H–J) The increased memory phenotype of CD122+ (gray bars) CD8+ T cells versus the more naive phenotype of CD122– (black bars) CD8+ T cells is depicted graphically. (K) The addition of IL-15 in vitro increased frequencies of CD8+ T cells recruited into the effector response as measured by dual IFN-γ and TNF production. IL-15 augments effector function across the spectrum of memory differentiation, as defined by CD28, CD95, CD45RA, and CCR7 expression. (L) IL-15 was superior to IL-2 in recruiting CD8+ T cells into an effector response. IL-15 augments cytokine production by CD28+CD95+ cells compared with CD28–CD95+ cells (P < 0.0001). (H–J) P values were generated by Student’s t test, 2-tailed. (L) P values were generated by 1-way ANOVA followed by Tukey’s multiple comparisons test; bars represent the mean ± SEM of 3–6 rhesus macaques. Results are representative of 3 independent experiments. *P < 0.05; **P < 0.01; ****P < 0.0001.